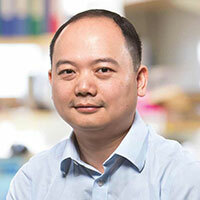 The overall goal of the research in the Zheng lab is to understand the role of regulatory and effector T cells in autoimmune and metabolic diseases. Using molecular, cellular, genetic, genomic, and pharmacological approaches, our research seeks to answer two key questions: First, how do Treg cells maintain their Treg identity in an ever-changing environment? Second, how do nuclear hormone receptors serve as modulators of T cell differentiation and function? Molecular mechanisms of regulatory T cell lineage stability and function. Regulatory T cells (Treg) are essential to the maintenance of immune homeostasis. A central question in Treg biology has been how Treg cells play a balancing act that lets them make adjustments to the environment and maintain their Treg identity at the same time. A pivotal player in Treg cell lineage development is the transcription factor Foxp3. Continued expression of Foxp3 in mature Treg cells is necessary for their suppressive function, but under inflammatory conditions, some Treg cells can lose Foxp3 expression, which is associated with autoimmune pathology. We are mapping the transcriptional circuit controlling Foxp3 expression, as well as the interactions between the Foxp3 promoter and enhancers in Tregs under different conditions. Our findings on Treg lineage stability will hold important implications for autoimmune disease treatment, cancer immunotherapy, and organ transplantation. Modulation of T cell differentiation and function by nuclear hormone receptors. Nuclear hormone receptor (NHR) super family transcription factors are involved in a wide array of physiological processes ranging from metabolic regulation to cognitive activities. A large number of NHRs are expressed in T cells, which led us to hypothesize that NHRs serve as modulators linking metabolic state to T cell function. To test this hypothesis, we are conducting a large-scale characterization of the roles of nuclear hormone receptors in T cell differentiation and function. Using expression profiling of NHRs in different T cell subsets, we have identified a number of NHRs that exhibit cell-type specific expression patterns, and generated mice with T cell-specific deletion of each of these NHRs. We are currently testing if targeting NHRs by their agonists is an effective way to modulate T cell differentiation and function in the context of autoimmune and metabolic diseases.